If you are searching for a resume template that can be used for most any field you will find the versatility this style offers to be the answer you are looking for. If you need a template that can be customized to a high degree you found it and you are free to get it here. Your details are all set to the left except for the top section where your contact info is divided in half. The section labels have page width backgrounds with upper and lower outlines the color of which is your choice. The company names, addresses, job titles and working dates are on one line. The school names, addresses, degree titles and degree dates are also on one line. If you have any special training or have won any important awards you can create new sections to put those in so they are readily noticed by the employer. To optimize your data the arrangement of your facts can be set to most closely match the needs of the employer. You can find out what they need by revisiting the job posting to pull out the specific skills and education they want. When you write, tailor your skills and training to match what the employer needs as best you can. You may find your skills and training may fall short of what is being requested. A suggestion would be to volunteer somewhere to get the needed skills. You could always take a college course or go to night school too. Unless you really don't fit the position try to write using the most applicable parts of your career history and focus on them. The worst that can happen is you won't get the job because you weren't qualified, but if you don't try then you definitely won't get hired. You also gain by getting experience optimizing your resume to a job description. 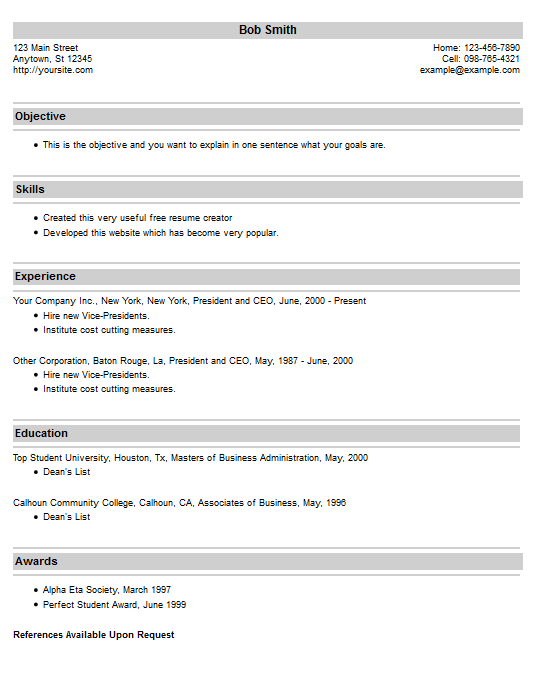 Get this and other templates from our resume management system for free, now!